It is where cozy Villa Solento lies idyllically embedded among olive and pomegranate trees that one of the Cilento’s most fascinating coastal sections starts. Monte di Luna marks the starting point of maritime wildlife park Infreschi, which with its impressive steep coast stretches up to the bay of the same name. 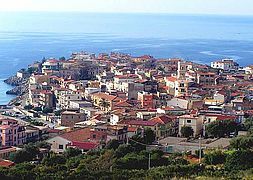 Therefore it comes as no surprise that the location of family Lamanna’s very well-tended holiday home is rich in panorama. 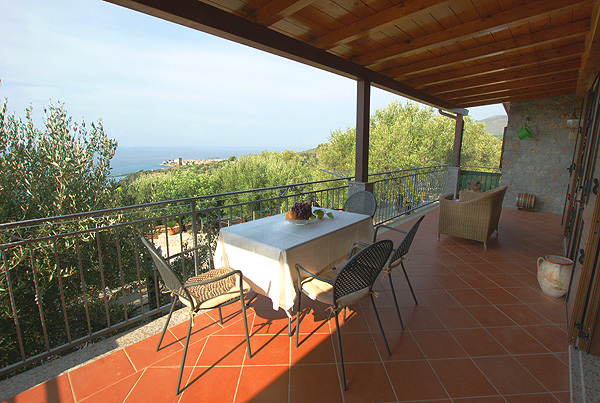 From the roofed terrace your gaze roams far out to sea and to the oldest part of the fishing village of Marina di Camerota, which lies on a striking headland. The two terraces of Villa Solento, olive and fruit trees, radiating bougainvillea, dwarf fan palms and lovingly planted terracotta vases invite you to relax and enjoy the dolce vita in the midst of Southern Italy’s nature and near its crystal clear sea. The inside of the holiday home, which accommodates 4 persons, radiates a cozy atmosphere. You enter the villa into a small hallway with coat rack and access of the guest WC. 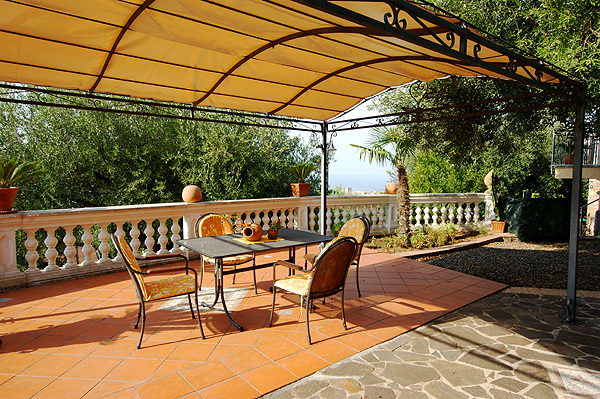 The heart of the villa is the living-dining area, which faces the sea. Both the living area and the dining area open onto the roofed sea view terrace, which runs the length of the house and is furnished with a small dining table and chairs as well as a two-seater rattan sofa. The cozy living area of Villa Solento is furnished with a large sofa, a comfortable chair, Sat-TV and a fireplace (only decoration). A round dining table with chairs for four and a glass cabinet with various glasses and dishes are found in the adjoining dining area. From the dining area you enter the kitchen, which includes 5-burner gas stove, oven, refrigerator with freezer compartment, drip coffee machine and toaster. 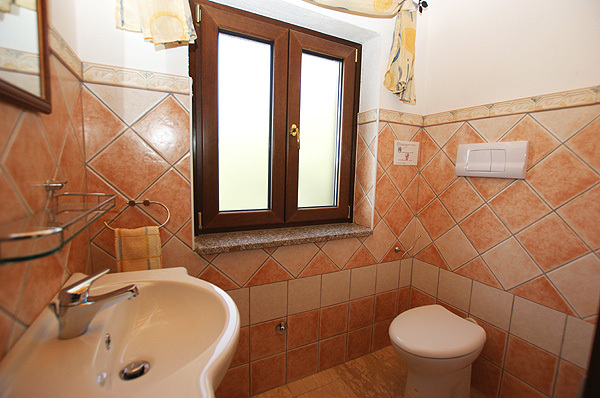 The two bedrooms, a double and a twin, and the bathroom with WC, bidet, shower cabin and hair dryer are found in the back part of Villa Solento. Family Lamanna has provided for comfort in the outdoor area of their villa, too. 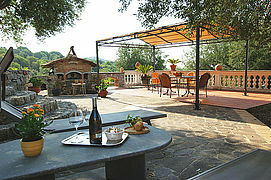 You find not only an outdoor shower at your disposal, but also a pizza oven and a grill, sunbeds and a roofed dining area on the terrace to the side of the house. From there you can catch a glimpse of the sea, too. One car can be parked on the fenced premises, either under the carport or right in front of the house. The washing machine in a separate annex can be used upon request. 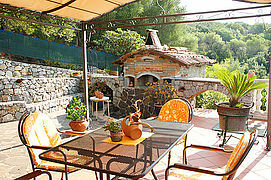 Villa Solento is furnished with gas heating. 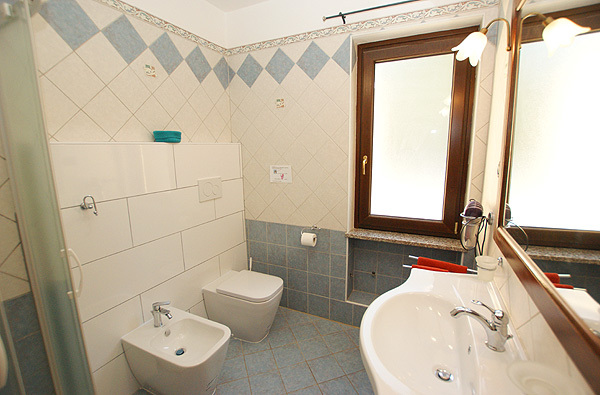 There is a dependance on the ground floor of the house, which, however, remains unoccupied during your stay. 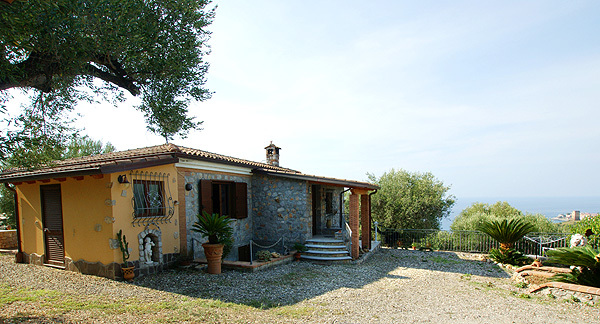 On the premises, located below Villa Solento and set off to the side, there is a second holiday home, which is screened from view and has a private driveway. A fence runs between the two holiday homes. 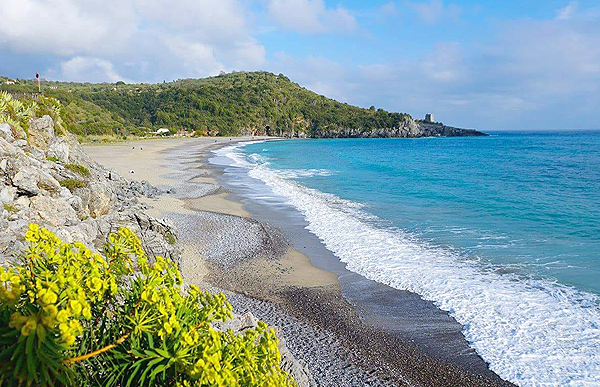 Lentiscelle beach, as of June partly with service, is located at the foot of Monte di Luna and at a walking distance of 900 m.
Worth a visit and a short hike – Pozzallo beach with family Marchese’s beach bistro of the same name. 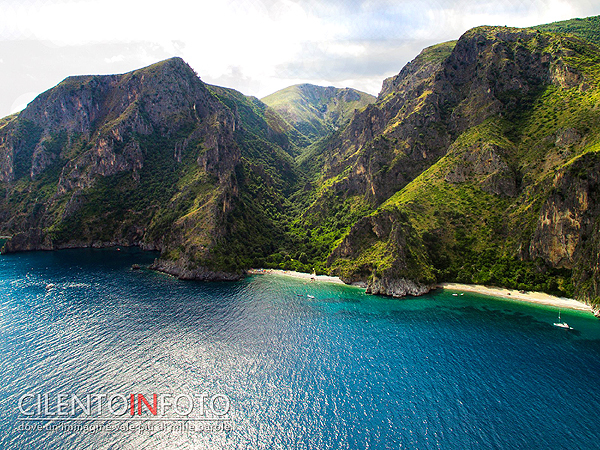 The beach bay is part of the maritime wildlife park and easily reached from Monte di Luna by following a heavenly panorama hiking trail. 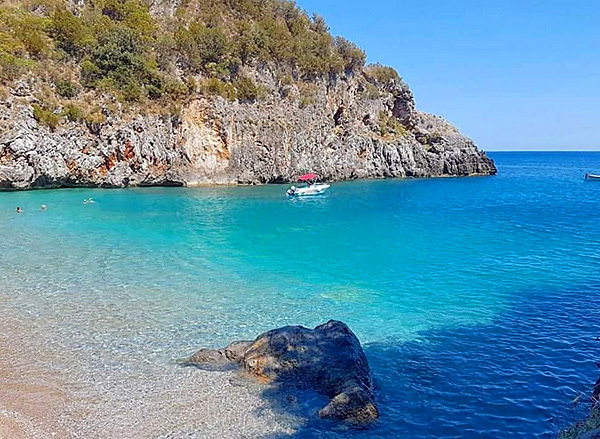 The boats of the cooperatives Cilento Mare and Cilento Blu call at the bay, too, and you can board them to continue on to Baia Infreschi or return to Marina di Camerota. Shopping is done at the supermarkets at Marina di Camerota, which are open year-round. A car is strongly recommended, because the supermarkets are ca. 1.2 to 2 km from Villa Solento. Every two weeks (not in August) on Friday morning a weekly market takes place in the harbor area. 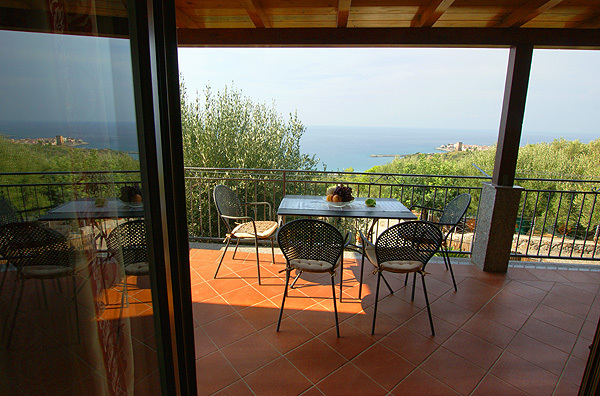 Especially during the summer months, a large number of restaurants in the center of Marina di Camerota invite you to wine and dine. Should you prefer the traditional fish cuisine of the Cilento, stop at Peppe Troccoli’s Ammore e Mare in the alleys of the marina. Should you prefer fish cuisine which is a bit 'fancier', look for Taverna del Mozzo at the lungomare, which is run by Davide Mea and, in general, also open at noon and far into low season. 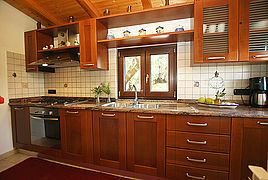 This also goes for family-run Ristorante Brera in Via Alfonso. Beautiful panoramic location – Villa Solento on the slopes of Monte di Luna (Marina di Camerota). Enjoy Southern Italian atmosphere on two terraces. 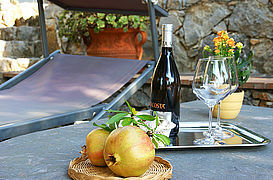 Very well-tended Villa Solento accommodates up to 4 persons. 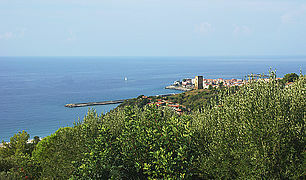 View from the house onto the sea and the town of Marina di Camerota. It starts at Monte di Luna: maritime wildlife park Infreschi with its spectacular steep coasts (photo: A. Caiazzo, Cilento in Foto). The living and dining areas of the holiday home with doors opening onto the sea view terrace. ....runs the length of the house. 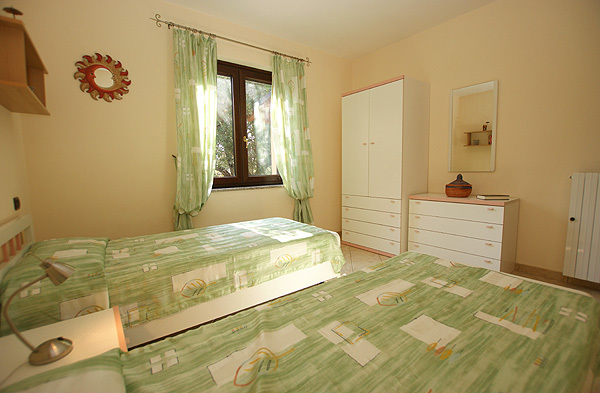 The double bedroom of the holiday home. The windows of the house are furnished with fly screens. Glance into the narrow kitchen of Villa Solento. 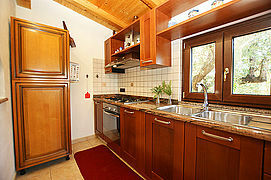 The kitchen is equipped, amongst others, with a drip coffee machine and a toaster. 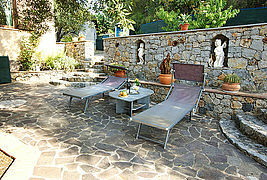 The large terrace next to the house: relax on the sunbeds and in the shade of an olive tree. Enjoy the green of fruit and olive trees and in-between a glimpse of the sea from this terrace. Dolce vita at Villa Solento. 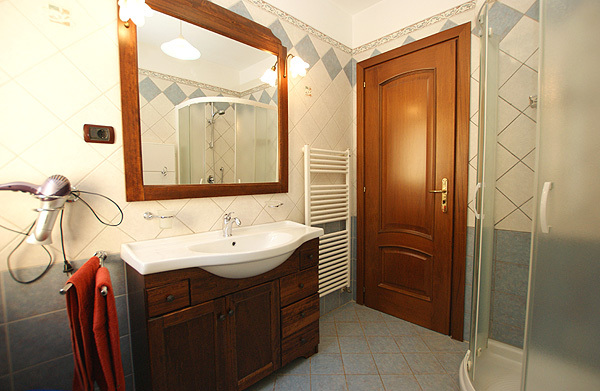 Glance into the bathroom with shower cabin. At a walking distance of 900 m along a foot path: Lentiscelle beach. In the background Monte di Luna (photo: A. Caiazzo). 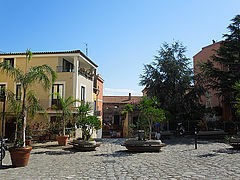 The colorful piazza of Marina di Camerota. Pozzallo beach can be reached by boat or on foot. 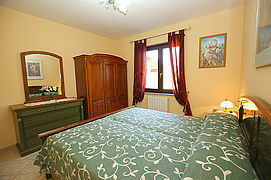 And, you can drop in at family Marchese's Ristoro Pozzallo (photo: Fam. Marchese). 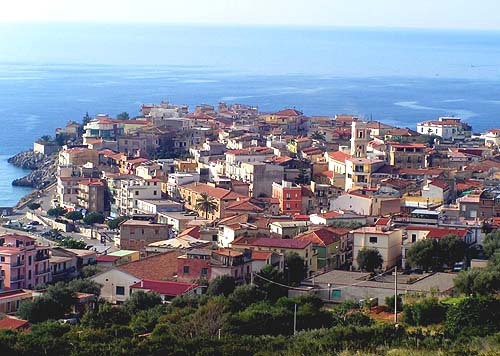 View of the center of Marina di Camerota. Costs for central heating: 10 Euro/ day (charged on the spot).